At 10am on Wednesday 11/28 there will be a ribbon cutting ceremony for a new trail. Given the snappy name of “I-90 Issaquah-High Point Trail Connector”, the new link connects the trails at the Sunset Interchange (exit 18 off I-90) with the East Lake Sammamish Trail where it crosses under I-90. The trail is completely separate from the streets except for a signalized crossing of Front Street just north of I-90. This is a largely transportation-oriented trail rather than being strictly recreational. From the Sunset Interchange you can go three (now four) different directions: up the hill to the Issaquah Highlands, east to Preston on the High Point trail, or down along Sunset Way into downtown Issaquah. At the other end, the East Lake Sammamish trail will take you either back into Issaquah or along the east shore of Lake Sammamish all the way to Redmond. I plan to be there for the opening. There’s more information on the Cascade Bike Club events calendar also on the City of Issaquah website though the details there are buried in a PDF. Our Mission is to reclaim New York City’s streets from the automobile, and to advocate for bicycling, walking and public transit as the best transportation alternatives. They started in 1973, have 5500 members, ten full-time and four part-time staff, and an annual budget of over a million dollars. Wow! I’m looking forward to mining through their extensive web site. I’m still glad I did what I did. At the very least it saved the city crew some time and cut back the blower emissions a little bit. Plus, I got some exercise as I can tell every time I try to move my arms today. What I really want to do in that spot is sweep away all the dirt on the sidewalk so it stops being a mudslick every time it rains. I’ll have to wait for a dry stretch to do that. Or maybe wait until spring when the flood season is past. My vision for GAIT is still evolving, but I’m picturing small actions to make active transportation more attractive to my neighbors. What I did today is an example. Yesterday on a walk to lunch at the Boarding House in Gilman Village, I saw a woman pushing a little luggage cart in the street on Juniper rather than using the sidewalk. She said she was avoiding the leaves on the sidewalk because they get stuck on the wheels of her cart. So today I went over there on my bike with my push broom and spent five minutes getting the worst of the leaves off the sidewalk. The push broom is a sub-optimal tool for this job. So from there I rode to Lowe’s and bought a rake. To try out my new rake I went to the part of the Pickering Trail that runs under the bridge that carries 56th over Issaquah Creek. The trail was designed to flood and it does at least a few times every winter. There is always a layer of silt left over when the city finishes removing the worst of the flood wrack from the trail. It makes things slippery, and it only gets worse when the autumn leaves fall over it. 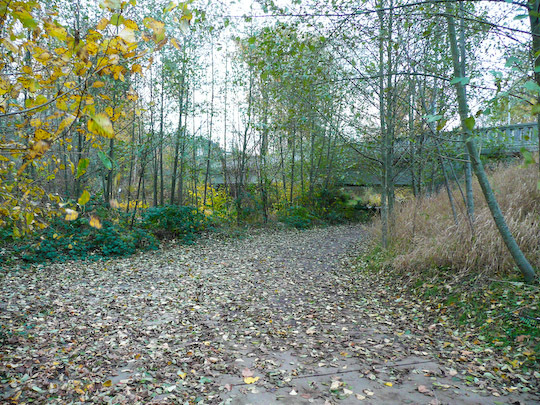 So I spent an hour raking most of the leaves off the part of the trail north of the bridge. I’ll do the part south of the bridge in a few days. Here’s a before picture. It was too dark when I finished to do an after picture.